Turkish President Recep Tayyip Erdoğan’s state visit to China later this month is intended to show that Turkey, as an international power, has interests well beyond its western alliances. But Ankara’s strong backing of China’s Uighur Muslim minority clouds the prospects for Turkish-Chinese relations. In 2012, Turkey, already a member of the North Atlantic Treaty Organization, became a “dialogue partner” of the Shanghai Cooperation Organization (SCO), a security grouping that comprises China, Russia, Kazakhstan, Kyrgyzstan, Tajikistan and Uzbekistan. Ankara has strengthening bilateral ties with all the SCO members; Erdoğan has depicted the SCO as a potential alternative to the European Union. The SCO’s economic component is slim, yet, initially, both China and Russia warmly welcomed Turkey’s interest. In 2013, Turkey chose a Chinese company to supply $3.4 billion worth of missiles, but the deal has not been finalized. That same year, though, an unidentified senior Chinese Foreign Ministry official told the Turkish news outlet Today’s Zaman that the SCO would consider Turkish membership bid once the body decided to expand. As of July 10, with SCO membership offers to India and Pakistan, that expansion has begun. But whether or not Chinese enthusiasm still exists for Turkey to become a full member is unclear. The issue of Uighur separatism in Western China appears to be a major source of uncertainty in Turkish-Chinese relations. A series of unconfirmed reports in pro-government Turkish media recently claimed that China banned its Uighurs from observing the Islamic fasting month of Ramadan, and that they allegedly had been forced to drink alcohol. The speculation stoked displeasure among both Turkish Islamists and nationalists, who identify Uighurs as ethnic Turks. In July, a Chinese restaurant in central Istanbul was sacked, though, ironically, the only person working there was a Uighur. Angry mobs in the Turkish capital, Ankara, attacked Chinese tourists along with mistakenly identified South Koreans. In response, Beijing immediately imposed a travel advisory against traveling to Turkey. With President Erdoğan planning to make a state visit to China on July 28, the timing of these events could not be worse for Ankara. “These are very nasty developments, and China will make us pay a very high price,” warned Murat Bilhan, a former Turkish ambassador and deputy chairperson of the Turkish Asian Centre for Strategic Studies. Bilhan predicts Erdoğan will have to spend more time mending fences than developing closer ties with China and Central Asia, a key goal of recent Turkish foreign policy. Lucrative trade has helped smooth over past spats with Beijing – including in 2009, when Erdoğan publicly condemned Chinese policy toward Uighurs. As of this May, China ranked as the top source for Turkish imports, at roughly $1.93 billion, edging out both Germany and Russia. China also was among the top 20 export destinations for Turkish goods in 2014, the latest date for which official data is available. In 2012, the two countries agreed to try and boost their bilateral trade by 2020 nearly fivefold to $100 billion. Mindful of that role, the Turkish president appears inclined to tread carefully with Beijing. He has condemned the recent anti-Chinese violence, even suggesting the attacks were part of a conspiracy against him. “Once Ramadan is over, this may yet be such an episode that both governments would be happy to leave behind,” suggested foreign policy specialist Sinan Ülgen, head of the Istanbul-based Edam think tank. 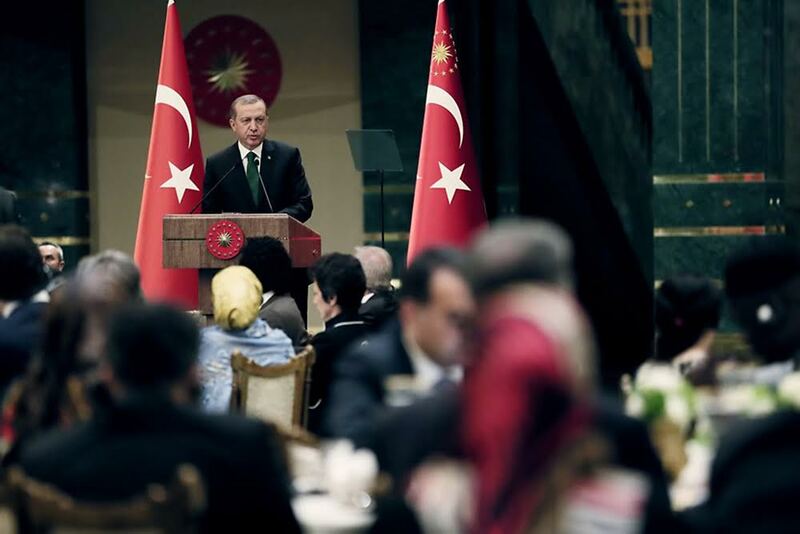 Ramadan ended in Turkey on July 16, but making amends with China may prove difficult. Beijing is linking Ankara’s support for the Uighurs to facilitating the cause of Islamic State fighters in Syria. The Financial Times reported recently that Chinese security officials accused Turkish diplomats of allegedly providing “fake passports” to Uighurs who were then “sold” to jihadist groups to fight in Syria. Turkish Foreign Ministry spokesperson Tanju Bilgiç on July 16 termed the claims “laughable,” but China, as elsewhere in Eurasia, has reason for concern. Muslims from throughout Central Asia and the South Caucasus have joined jihadists in Syria by using Turkey as a conduit. These days, officials in many Eurasian countries are worried about potential consequences if/when militants return home from Syria. Given the simmering resistance of some Uighurs to Beijing, Chinese authorities are also leery about Turkey’s role “as a motorway to Syria,” noted Bilhan. “This is one of the reasons why Turkish-Chinese relations are not based on [mutual] confidence,” he said. Turkish security forces have begun an unprecedented crackdown on activities suspected to be tied to Islamic State: last week, 25 Tajiks were among 45 anti-jihadist arrests in the southern city of Gaziantep. But other changes might also play into Turkey’s SCO ambitions. Talk of rapprochement with Turkey’s Western allies and the EU is on the lips of many. If the AKP forms a coalition with the Republican People's Party, a proponent of Turkey’s traditionally pro-Western foreign policies, that process could mean an end to Erdoğan’s eastern dreams, including any ambitions of SCO membership, some analysts predict.